Maura Claire Harford as Toni and Sam Lunay as Bo. “Appropriate” by Branden Jacobs-Jenkins, directed by Jeff Mikoni and produced by Diego Maramba is now playing at Silver Spring Stage in Silver Spring, MD. 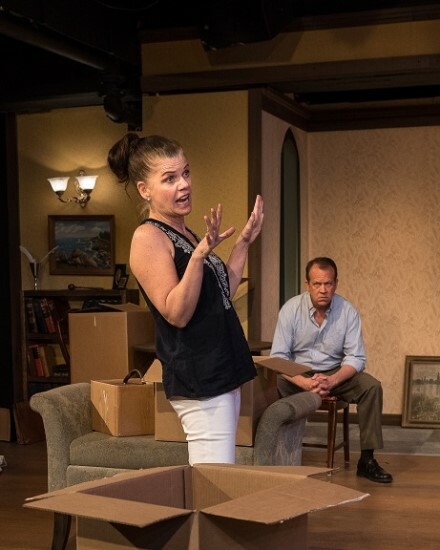 The play premiered in 2013 and won an Obie Award for Best New American Play for the 2014-2015 season. The three Lafayette siblings arrive to sell the family plantation where their father spent his last 20 years after raising his family in Washington, D.C. The trio does not come alone. Toni (Maura Claire Harford) brings her wayward soon Rhys (Conor Donahue), Bo (Sam Lunay), his wife Rachel (Kate Shea), his teenage daughter Cassie (Kerala Bannister) and his young son Ainsley (Michael Greenleaf) and Frank ((David Dieudonne) his fiancée, the spiritual River (Rebecca Cohen). Frank has been estranged from his family for over ten years when he dealt with addiction and a troubling past which is not revealed until the end of the play. Toni is still bitter from a divorce and dealing with her troubled son while coping with her dying father for whom she was the main caretaker. Bo’s wife Rachel has never felt accepted by this family due to her religion -Jewish- while Bo has shouldered a great deal of his father’s financial responsibilities during his illness. Both Bo and Rachel have to deal with their smart but somewhat apathetic daughter. Tensions rise when an old photo album is accidentally discovered. The horrific pictures lead to an examination of their father’s real soul, and their own feelings of their father which range from deep respect by Toni, the oldest, to loathing by Frank, the youngest. Bo seems to have the most realistic view of his father, perhaps his perspective from being the middle child. However, it doesn’t matter how you pronounce ‘Appropriate.’ It is definitely an opportune allocation of your time. Try not to miss it. Harford’s Toni Lafayette not only carries the family’s burdens on her shoulders, but Toni is the pivotal character in the drama. Everything seems to revolve around her. As she exposes her thoughts to her family, we see her has the most introspection into her own flaws even when she exhibits childish behavior. In her scenes with her son, she is caring and hurt and with her brother Frank, biting and harsh. Lunay has a hard task because Bo is a man who has really been in the background most of his life. The child who was very successful (attended Yale and had a fine career), but whose father favored the other siblings. His wife also requires emotional work. He struggles to be a good father, but even Bo has skeletons he would rather remain in the closet. Lunay succeeds in making Bo a person with whom we can identify. Dieudonne, a regular at SSS, recreates the arc the playwright has written for Frank. He is at first quite sympathetic. Later as his past is revealed, we may even despise him and, finally, we hope he can conquer his demons. The scene where Frank tries to apologize to his siblings is filled with tension wonderfully recreated by the three actors. As the family outsider, Rachel, Shea’s final scene with her Bo, allows the audience to see how toxic this family can be. She tells her husband how the Lafayettes have always brought out the worst in her. On the other hand, she, too, has a blind eye to her husband’s failures and her children’s flaws, and Shea’s interpretation expresses that to the viewer. Cohen, as the ethereal River, keeps the character’s feet most solidly planted on the ground. We feel her devotion to Frank and her optimism even when surround by all this pessimism. Her scene with the shrewish Toni who tries to shake River’s love and tear off her façade is one of the highlights of Cohen’s performance. As the new generation, Donahue does an excellent job as the brooding Rhys who we want to like but, like his wayward uncle, is not always just a rebel, having his own dark side. Bannister successfully portrays the apathetic teen, Cassie, who fearlessly confronts her parents and often stages clever rebellions. Greenleaf does a fine job as Ainsley who is too young to absorb some of the enormity of the revelations happening around him. Mikoni’s direction helps grab the audience’s attention right from the start. He tactfully deals with some of the strong material as “Appropriate” is also about racism, drug and alcohol addiction and child abuse. The set by Andrew S. Greenleaf deserves this rave review. Greenleaf recreates the former opulence of this family, the shabbiness of this once large plantation and the negativity that lurks in its walls. Greenleaf is also credited with the surprising special effects at the end of the show. Vanessa Lam’s lighting design, Jeff Goldgeier’s sound design and Kristen Lue’s costume design complement this most impressive set. Perhaps the most interesting part of the drama is that Branden Jacobs-Jenkins is an Afro-American writing about a southern white family, and not just any family but one whose ancestors owned slaves. Seeing things from this perspective is enlightening. During intermission, there was some discussion in the audience whether you pronounce the title of the play as the adjective or the verb. It actually fits in either way. However, it doesn’t matter how you pronounce “Appropriate.” It is definitely an opportune allocation of your time. Try not to miss it. Advisory: Strong language, adult subject matter including racism and child abuse, and violent scenes. “Appropriate” plays weekends through April 28, 2019, at Silver Spring Stage – 10145 Colesville Road, in Silver Spring, MD, in the Woodmoor Shopping Center. For tickets, purchase them online. There will not be any performances on the weekend of April-20.